Hola! Seems like forever since I posted, but now I have a new camera it's all about getting back into blogging. As of now I've a huge pile of products needing photographing and it's SO overwhelming. I need a little photography elf. 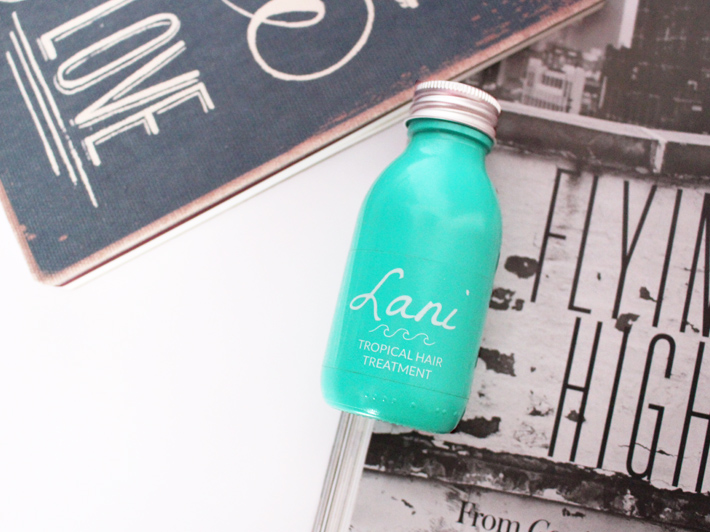 The ingredients used in Lani Tropical Hair Treatment (£10.95) are simply; virgin coconut, kukui nut, macadamia nut and camellia seed oils, so it is completely 100% natural and suitable for vegans. When combined these oils all have antioxidant and vitamin packed benefits for looking after the condition of your hair for both long and short term results. The coconut oil (which I'm pretty sure we're all obsessed with now?) means Lani smells heavenly, and completely reminiscent of beach holidays, meaning you get "Beach babe hair in a bottle." On their website they suggest that every 100ml bottle will last 6-12 uses, which of course depends on how much product you use on your hair. I'm about half way through, use it relatively sparingly and have done about 8 applications so far. My preferred method of using Lani is to slather the ends of my hair in product, put my hair up in what I call a "Pineapple bun" on the top of my head and let it do it's thing whilst I sleep. And I can pretty much guarantee when I wake up my room will smell like heaven, and my hair will look well, greasy until it's washed off... But that is when the magic happens. My hair looks shiny, feels deeply conditioned and the frizz is non-existent. Being such a wonder product, styling my hair afterwards is made so much easier and quicker thanks to the need for less tools and styling products. Honestly, my hair has never looked so good and soon as I reach the bottom of this bottle I'll be repurchasing. I can't get enough of this stuff! 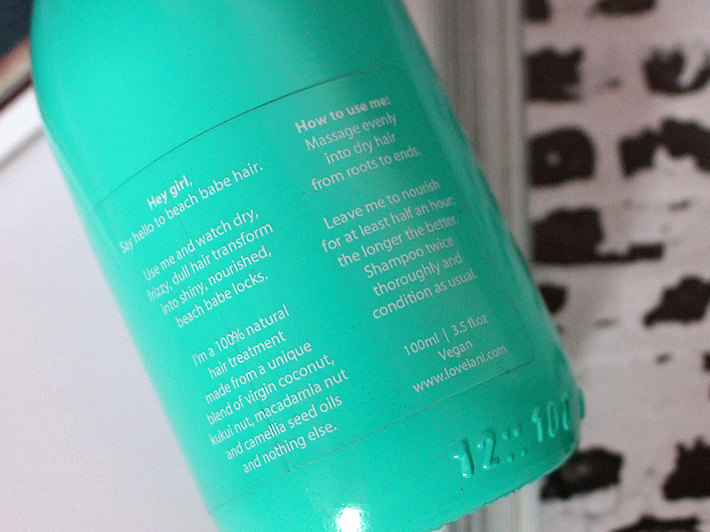 Without a doubt, when I think of hair oils, Moroccanoil is the first thing I think of. With it being my first foray into oils on my hair (well, all oils for that matter) and being one of the greatest things to ever happen to my hair, I truly thought it would never have any competition. But after voicing my opinions on being in a beauty rut, and coming across a silicone free formula by Redken, I ventured out into the land of hair oil, and was pleasantly surprised. First of all, how gorgeous is that diamond inspired bottle? It isn't completely opaque though, if you hold it to the light you can see how much product is left - genius! Much unlike Moroccanoil, Redken's Shatterproof Shine has a dropper in the lid to get it out the bottle, and I have to admit, this is the one thing I don't like about this. Given its very runny texture, it has a tendency to get a little messy at this point. Pumps are much friendlier for hair oils. Companies, take note. The oil itself has a gorgeous scent, (which my non-technical nose would suggest to be apricot) and luckily, it disappears as soon as the oil has soaked into the hair, meaning you're still left with the clean, fresh scent of your shampoo. Whether it's used on damp or dry hair, this soaks in instantly and leaves behind tame, frizz-free locks with a beautiful, natural shine. I tend to use one dropper pre-blow dry, and two droppers post-blow dry and have found that my hair requires little/no styling afterwards, which is where Redken wins in the hair oil stakes. Whenever I've applied a lot of Moroccanoil, I have to wait overnight for it to soak in, Redken's is much less high-maintenance, and will leave hair looking healthy and conditioned immediately. If we overlook the poor applicator it's very very possible I just went and found a new favourite hair oil. I would truly recommend this to anyone in the market for a new hair oil, and given it's only £23.95 at the moment on FeelUnique, it would be wrong to say no, right? Have a great week guys! Hopefully I'll be back to regular posting soon as that camera of mine starts working again. Pourriez-vous m'indiquer la pharmacie, s'il vous plaît? All pictures are owned by Molly Lyon unless stated otherwise. Powered by Blogger. © Lyon Notes. All rights reserved.